GRRR! I've tried about ten times to post a photo of the socks I finished last night. Nothing doing, it just will not load. It's from the same roll as the picture below and I was posting minutes after that last enry, so I'm assuming it's BLOGGER. In the picture below is some wool from Katie at Live2 knit. That is wool to be dyed, althugh I'm leaving it as it is. Superwash merino. Have a look at her site. The picture I can't post is the Monet colourway, very aptly named, the colours do indeed remind me of Monet paintings. Unfortunately, you can't see the lovely lacy pattern on the leg or the super neat picot edge. I really like the yarn from both Katie and the Knittery and as they are both Australian, postage is heaps better than coming from OS. Lovely colours and beauriful soft wool which is gorgeous to knit and wear. Have a look too at Katie's lovely lace weight and the variety she has in materials. Now I have half a sideways jumper to knit for a young baby boy I know. It won't be needed for several months and I'm making a size 1, so no problems with fit. 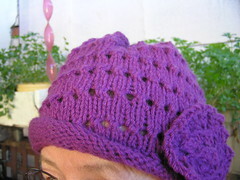 I want to do some more hats and scarves for the church to give away, but really don't have anything else much planned. I'm not on the so-called official yarn diet, but I am being careful to avoid temptation, particularly in the area of sock wool. I really have lots at the moment. Oh, oh. Just remembered the lace wool I bought at Tapestry Craft. I've tried a few shawls with it and ripped them out. I want something for me, probably rectangular, lacy but not too complicated but still stunning. Don't want much, do I? If I keep the wool where I can see it, I'l be thinking of it and some pattern I like will turn up. I'm enjoying these bamboo needles which I bought before Christmas at Tapestry Craft's sale. I've bought their bamboo circulars before and hated them as the yarn seemed to catch on the tiny bulby bit at the join of cable and needle. I bought these because of the length, 15 cm or about 5" and cast on another sock last night. They are wonderful. They are very smooth and easy to hold and while they look slippery, they aren't. The wool moves very smoothly but there is no slipperiness to them. I'll get some more. These are AUS$11.20 on full price. The sale was less 20%. Clicking on image will give a bigger picture. The background is an apron from the Oxfam shop in Sydney. It was a present to me from one DIL. (I run a small canteen and need an apron in food preparation.) It was made in Nepal from material woven by a co-operative of Nepalese women who also make the finished article. She also gave me some fairtrade chocolate but I'm afraid I can't show you that as it's all been eaten! There was a lovely book called Bittersweet Chocolate which has some wonderful recipes using chocolate in it. Interspersed with the recipes are pages detailing the hardships of cocoa producers at the grassroots level and some of the history of the fairtrade movement. I sound like a chocaholic. I'm not really and I hardly ever buy it. When I do buy some, it's the super dark stuff 75-85% cocoa solids and I have just one piece at a time. Unfortunately, that's dearer than Cadbury junk and I don't buy anything Nestlé. As for compound stuff like most commercial Easter eggs or Snickers/Mars bars etc... Ooops, I don't remember climbing on that particular hobby horse. I'll get down now. I hope I don't have too many posts in this new category of sheer stupidity. Late yesterday, I decided to watch the 5th cricket test on TV. Spurred on by finishing two UFOs earlier that day, I picked up a pair of socks. I've done one of them and love them. Absolutely gorgeous wool from Katie at Live 2 knit. Colourway named Monet. Lovely colours. So I find I'm part way down the shortrow heel. No problems. Off I go, paying little attention to the knitting except when I wrapped the stitch. Somehow it's become my practice to not look at the heel until I've done a couple of full rounds after the heel. Then I admire the neat row of heel stitches. So I finished the heel, picked up a couple of extra stitches at the corner, did a few rounds, decreasing the stitches and looked at my handiwork. Yikes!! I had turned a heel twice, so I had a very peculiar looking sock dangling from my needles. Sheer stupidity on my part and I have no idea how I actually managed ot do it. I know why I didn't see it at first. Perhaps I should have taken a photo. I was so cranky that I ripped it out altogether, right back to the very beginning of turning the heel. I've picked it up and am almost finished the heel again and can now laugh about it. Here's a picture of the third shrug I have done in about two weeks. There's a photo a couple of posts down of the first deep purple one I did for Miss 2. Her sister received one as well. I forgot to photgraph it, but it was done in a soft blue and two shades of pink. I did the back in stocking stich stripes and the sleeves were feather and fan like the purple shrug. This is for Miss 6, their cousin. We have our family Christmas do at her place this Saturday. This lunch rotates around the family and we all contribute to the food. All children receive gifts from everyone and as for the adults? We draw a name from a hat about June and buy for one person only. We normally have the lunch on Boxing Day or thereabouts, but my son lives about an hour away, up the Pacific Highway. The road then would have been a nightmare of traffic, so we made it later. My contribution this year is fresh homemade bread rolls, Vietnamese rice paper rolls and by special request from two sons, small onion tarts, no more than a mouthful. I used the same basic pattern I linked to in the earlier post. However, Miss 6 is both taller and bigger than her younger cousins. I used the principles of the shrug and worked out stitches from my tension. 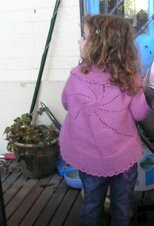 I've used the Cleckheaton Breeze for all three shrugs and really enjoyed knitting it. This colour is reasonably accurate, a pretty aqua.The pattern for this looks closed as you can see in the top picture. However it's really quite stretchy as can be seen when I put my fingers in the sleeve. I'm fairly confident that it will fit her well. Combined with the stretchy yarn, it is a good combination. Yarn is 80% cotton, about 19% wool and the tiny bit left is lycra. The pattern was very simple. It's something I've known for a while now. You will need a multiple of 4 plus 1 stitch. Row 1: Knit 1, *YO, knit 2 together, purl1, knit1. * Repeat from * to * till end of row. Row 2: Purl 1, *YO, purl 2 together, knit 1, purl1. * Repeat from * to * till end of row. This is the Cleckheaton baby jumper I mentioned some time ago. While neither of the parents is tall and I don't expect the baby to be big, the jumper looked far too short to me. Ths baby will be born at the end of autumn/early winter and I wanted the jumper to last more than a week or so. So today I fished it out of the plastic bag where I had put it before Christmas, and picked up stitches around the bottom on a circular needle. About an hour or less of knitting, saw an extra bit on the bottom and I put some rib on it to stop the stocking stitch curling. It really needs blocking or pressing, but as there was a sunny patch in a fairly grey day, I took a photo. there's more than one way to wear a sock!! At the weekend I had an eye infection. Unfortunately this meant no knitting and no computer either. Eyes wept copiously and were very swollen. To me they felt like golfballs, although the mirror showed they weren't quite that size. I was quite uncomfortable and wondred how well I would sleep. Then - an idea. I had a cold compress in the fridge in the shape of a mardi gras type mask for the eyes only. It was far too cold to put straight on my face, so I burrowed in the bottom of the sock drawer and found an old narrow, ribbed sock made from Lion Brand magic stripes. Just the thing I needed as the ribs meant the mask was confined. I lay most of the night on my back with the cold mask on and found that I surprisingly slept quite well. Not only did I sleep, but the eyes were much improved the next morning. Fortunately, I have no photo to show you. It must have looked very strange. Me on my back with a purple striped sock carefully positioned over my eyes. I'm glad my husband didn't think of a photo as he went past in the morning.